Basket of pansies and lily-of-the-valley with heart border and bumble bees buzzing around. The kit has large scale black and white charts printed 10 stitches to one inch showing half the design on two A3 sheets, one with key. 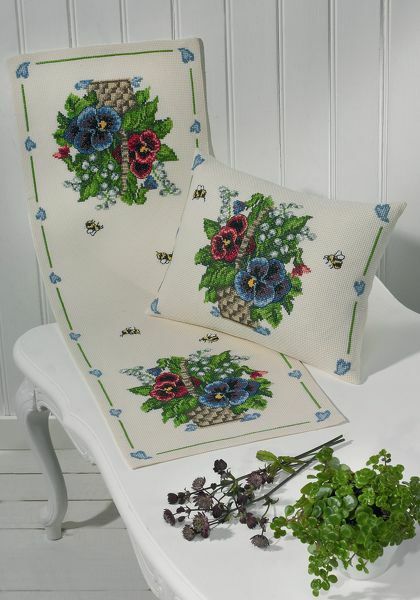 The pattern is worked in whole cross stitch using 20 shades of pearl cotton no. 5 unsplit and backstitch using three strands of black stranded cottons. The basket pattern has a stitch count of 75 by 75. The table runner has a basket at each end and the total stitch count is 105 by 310. The cushion with a single basket has a stitch count of 105 by 105. Stitched on one half of the fabric with the remainder as backing, filling not included.